On March 29, 1869 two soldiers, Sgt. Adams and Pvt. McLoughlin, stood upon the shore of Newport Harbor. They braced themselves against Rhode Island’s biting, late-winter wind by pulling their blue, army-issued wool coats tighter around their shoulders. The young private blew a few hot breaths into his cupped hands before raising his gaze toward Fort Adams in the distance, which stood resolute against the ominous clouds beyond. They’d spent their short leave in the bustle of Newport, but they needed to get back to their posts before nightfall. The day had been unremittingly colorless and cold, and the rumble in the distance warned them that a storm was brewing. The harbor, though somewhat protected from the wild waters of the Atlantic, was infamous for becoming treacherous quickly. But the two soldiers had hired a boy, a young sailor who’d sworn he’d be able to guide them to the safety of the fort in even the roughest weather. And they did really need to get back to their posts. As soon as they set off dark clouds descended on them. The late-evening light withered into darkness, the wind began to howl, and the waters around them begin to roil and spill over the sides of the boat. The men were soldiers, not sailors. They had little experience with the grey, icy waters that churned beneath them, and they were beginning to see that their 14-year-old guide was far less experienced than he’d led them to believe. The rain lashed against them, soaking them to the bone, their heavy coats growing even heavier. As the wind spun them round and the waves toss them side to side, the three men became disoriented, uncertain whether the safety of the fort lay ahead or behind. Then through the squall they saw the faintest glimmer of light. From the lamp room of the Lime Rock Lighthouse a light shone faithfully—as it had since the day the Lewis family had first been given the task of caring for it. But if the three beleaguered men felt any sense of relief, it was quickly dashed as a mighty wave overturned their boat and tossed them into the icy water. Meanwhile, in the lighthouse sat Ida Lewis, the eldest daughter of the light keeper. She was sick with a cold and trying to keep warm by the stove as the wind howled outside, forcing the shutters to crash against the house in an irregular staccato. Then Ida heard something, panicked shouts mingled with the howling wind and rain. In a flash, she was out of her chair, throwing open the door to the fury of the storm outside. From the lighthouse’s perch atop the craggy island, she could see men in the water, struggling to find handholds on the upturned keel of a boat. She knew that the billowing waves would soon take the men out into open water. Without stopping to put on a coat or shoes, Ida ran out into the night. She clambered over the rocks, slick with rain, and into her rowboat. As she pushed off from shore the wind and freezing rain threatened to drive her back, but she rowed with all her might. Wave after wave crashed over the bow, nearly sinking her, but the men’s desperate pleas gave her the strength to press on, her progress painfully slow. By the time she reached them there were only two souls left to save. The young sailor had slipped under the water almost as soon as their boat had capsized. But to save Adams and McLoughlin, Ida summoned all the strength in her 103-pound frame and dragged the nearly-unconscious men into the boat with her, lifting them over the stern as her father had taught her in order to minimize the risk of capsizing herself. When Ida finally reached the safety of the lighthouse she was frostbitten, Adams could hardly walk, and McLoughlin was unconscious. Yet in the end, both men lived. The men she plucked out of the storm that day were counted among the total of 18 lives that Ida would save throughout her life in the lighthouse, first as the child of the light keeper and then as the light keeper herself. none more true and brave. none more sure to save. In our lives the tempest and the wave will surely come. Be they disappointments, tragedies, worries, or unanswerable questions, each of us will have moments where we’ll find ourselves overcome by the roar of the squall and the rush of the tide. We will lose our way. Our lives will be caught up and capsized. And in the midst of those storms we may even see a light burning steady and true, but we find ourselves hopeless to reach it. We feel too far, too weak, too lost. But the glorious truth is that the light keeper’s child has already come to our rescue. He’s left the safety of his home, rowed out upon the troubled sea of our world, and braved the worst storms of this life so that we who are shipwrecked can be saved. Skomal, Lenore (2010-06-15). Lighthouse Keeper's Daughter: The Remarkable True Story Of American Heroine Ida Lewis. Globe Pequot Press. Kindle Edition. This is new work. New work feels good. I wouldn't say that the work of doing new work always feels good, though, because work is hard. Work requires bravery. I've been learning a thing or two about bravery lately. I had the privilege to share this piece for the first time this past weekend, after which a friend asked me where the idea and the words came from. The answer, first and foremost, is that any new creative work comes from God. After all, my creativity and the output thereof are simply smeared reflections of the God whose creativity filled unthinkable void with all that we now call reality. Secondly, the work comes from deep inside me. Most every artist will tell you that any worthwhile work is knitted into the fibers of their soul and is an expression of what he or she is thinking about, hunting for, fighting against, or crying over. Perhaps you've heard of the Six Degrees of Separation, the theory that every person in the world is only six-steps removed from every other person in the world, only six introductions away from meeting their hero, their crush, their doppelgänger. Almost two years ago two friends of mine created a series of mixed-media pieces. 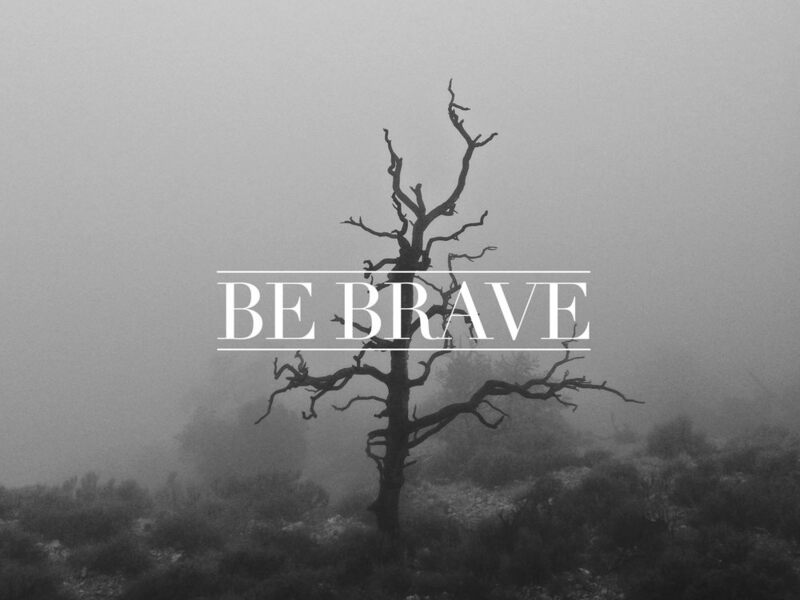 Working in collaboration, Sarah Carter and Whitney Schey combined their gifts in photography, painting, and collage to create a gallery they entitled "Be Brave." (Of course.) The work they made together was stunningly beautiful and caused a stirring in my heart and the recognition of the beautiful side of bravery. A year ago my church, ROCKHARBOR, began a series in the biblical book of Acts. In this story we saw men and women facing persecution, isolation, imprisonment, and death for the sake of carrying the message of Jesus' death and resurrection, offering hope, freedom, and forgiveness for all who would believe. Week after week God's word has held up a mirror and asked me if I am willing to be brave. A month or so ago I first heard Sara Bareilles' single "Brave." Catchy. Very catchy. But more than being catchy, the song struck a chord in me. I played it on repeat day after day. As someone who loves words, her song reminded me that bravery often materializes as language because words are powerful. Being brave sometimes looks like speaking up, filling dangerous silence. As I listened to that song again and again I began to wonder about the vocal side of bravery. And last week an artist and writer I follow named Blaine Hogan wrote a beautiful piece called "You Are So Brave!" He told the story of his daughter's frightening experience of seeing fireworks for the first time, and he reminded me that sometimes we have to coax bravery out of one another. We have to call and commission one another to be brave. All of these influences, these flavors, started stirring in the pot together. And finally, it was time to write. The first output of that was this piece based upon a journey through the book of Acts. I wanted my church to see the beauty of bravery. I wanted them to look in the mirror of God's word and be inspired. I wanted to bravely use words to fill silence. And I wanted to call and encourage them to do likewise. This piece is a call to the church to BE BRAVE for the sake of the gospel. But this idea is still stirring. I don't think I'm done with bravery. An interesting article reflecting on the apparent stagnation of culture—art, architecture, fashion, design—amidst the constant innovation of the technology sector in the last twenty years. Quite thought-provoking. You Say You Want a Devolution? On the way to work the other day—sitting in morning rush hour traffic on the 55 with featureless grey clouds passing overhead—this song shuffled my way. Just try to explain to me why I burst into tears. Now, since we’re all about honesty, I’ll admit, I am a crier. But still, I have no idea why it happened. I haven’t been able to shake this melody. It keeps pulling me back, again and again, and I’ll find myself allowing it to repeat, sometimes for half an hour or more. …and there’s something in it—something I identify with—that I haven’t quite been able to name. It seems to create perfect harmonies with something inside me.